Designed to fit your Taurus Millennium G2 PT 111, this ProMagTM Replacement Magazine provides guaranteed reliability and smooth-feeding action. Heat-treated blued finish with 15-round capacity. PLEASE NOTE: This Magazine WILL work with the newer Taurus G2C Pistol. 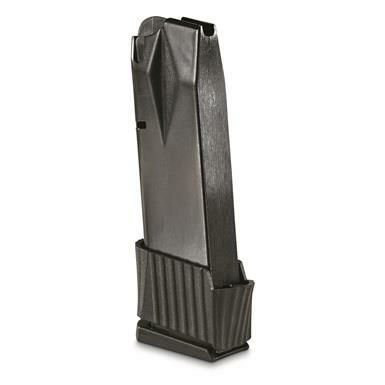 ProMag Taurus Millennium G2 PT 111 Magazine, 9mm, 15 Rounds, Blued Steel is rated 5.0 out of 5 by 8. Rated 5 out of 5 by daniel from works great I have a pt111- not a g2 (I've had it a while) but this mag works just fine. Rated 5 out of 5 by Kathleen from My son was very pleased with the purchase. Rated 5 out of 5 by zeke from Great Price Half the price of a Taurus mage, good Quality and 3 extra rounds. Rated 5 out of 5 by Nike from I love it Got it last week and I already took it to the gun rang and shot with it and it's the best ever. 100% reliable love the pro feel to it and how smooth it is. 15 +1 rounds is better then 12 +1 , next get the 32 rounds.. Will keep buying from here. Rated 5 out of 5 by Randy from BEST PRICE DITTO FIRST REVIEW. WORKS GREAT. GREAT PRICE. I BOUGHT ANOTHER ONE, AND A 32 ROUNDER. YOU TALK ABOUT FUN. 84 SHOTS BEFORE I HAVE TO RELOAD. Rated 5 out of 5 by Terry357 from Just as good as factory Can't beat the price, and looks awesome in the gun. Shoots like factory mags with no hiccups. Going to pickup a couple more for the range too!